In former times all horses from the Middle-East were called "Arabian" by the sellers in the markets and by travellers. Early travellers were not particularly discriminating about the naming of horses and horse breeds as already stated. 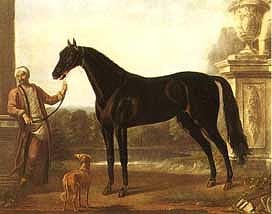 On examination of the portraits of horses taken to England it can be noted that these animals are actually larger than the Arabian horse in terms of height in comparison to their handler, i.e. 15 hands plus. They were used to cross with the small English racehorse, the Godolphin Arabian, the Darley Arabian, the Byerely Turk, Darcey's White Turk,etc. Subsequent testing in America by Dr. Cothran emphasises the link between these horses and the Thoroughbred origins to the Akhal Teke. (400-500A.D) in comparison with that of the 2,500 year history of the Akhal Teke in the Middle East. Heroditus tells us that the Arabs following the army of Xerxes rode camels not horses and that there were no horses to be found in Arabia. In Assyrian battles with the Arabs in 733 A.D. they captured camels, cattle and fowls but no horses. The Arabian horse on the whole has always been smaller than the Akhal Teke horse and does not match the Akhal Teke in terms of speed. 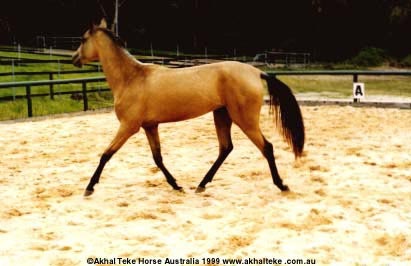 Some of the colours characteristic of the Akhal Teke are Dun, a common colour in Akhal Teke breeding and Palomino as in Darcy's Yellow Turk. 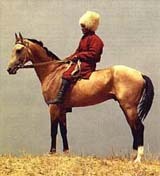 The Arabs often crossed their mares with Akhal Teke stallions to produce a larger, speedier horse. 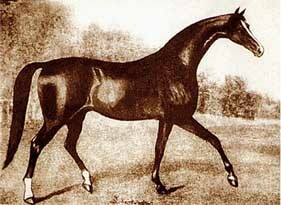 The Munique strain of larger Arabians is said to have been developed this way. Which horse is "Thoroughly" bred. An heretical opinion?